I can mention nearly any international ethnic cuisine to my friends these days and elicit barely a shrug. The one region that is guaranteed, however, to elicit a “huh?” reaction is central Asia – the cuisine of Uzbekistan, specifically. Few have traveled there or know someone with ethnic roots from there, and let’s face it, former Soviet republics aren’t usually known for their cuisine – an unfair byproduct of cold war misconceptions and the actual truth of communist-era deprivation. It is a misconception worth fighting: certainly Russian food has much to offer**, and enough silk road cuisine has migrated northwest towards European Russia over the years that the source deserves even a closer look – that is, if you can find it. 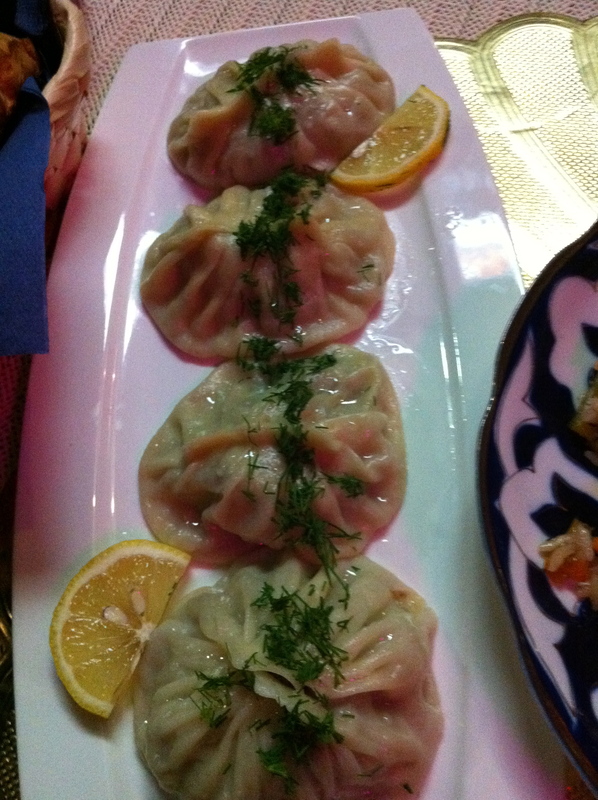 Prior to my recent trip to Vienna, I hadn’t eaten Uzbek in several years. So when we were searching for non-schnitzel alternatives for dinner on a Sunday night, I got pretty far into googling the (extensive!) array of ethnic joints before taking a flier on “uzbek restaurant vienna.” What a surprise to find Restaurant Samarkand, and even more of a surprise to note that it’s located relatively close to the middle of the city! We immediately got to walking from our Pension. Given that we ate al fresco, I can’t comment on the restaurant’s atmosphere (you can check others’ photos here, including some of the dishes we didn’t order). I can state that the wait staff is relatively proficient in English as well as German, which was much to the relief of the table of Americans (how odd?) that pulled in behind us. The food, however, was great. Our mutual favorite had to have been the plov, pictured at upper right. It’s far closer to fried rice than the box pilaf your mother buys at the grocery store – the grains of rice glisten, and the peppers and carrots provide some yellow-orange glow. The lamb chunks had excellent flavor, and had indeed lent some of that flavor to the rest of the dish upon cooking. The other favorite was the Manti dumplings (second photo), which I think would be found very often in a Russian restaurant as well. Thick-skinned and filled with lamb, this time accented with onions, and sprinkled with dill (a frequent Russian ingredient), these have to be some of the best dumplings around. With a little sour cream dip they become truly decadent. I was a little disappointed by the laghman – this beef stew with hand-pulled noodles has never been my ultimate favorite (I prefer the Xinjang stir-fry version Giro Laghman), but I usually just order it for the noodles. This time I felt they were a little overcooked. I hope to be back in Vienna soon to sample the rest of the menu; this review is obviously incomplete without trying any of the kebabs or the other dumplings. 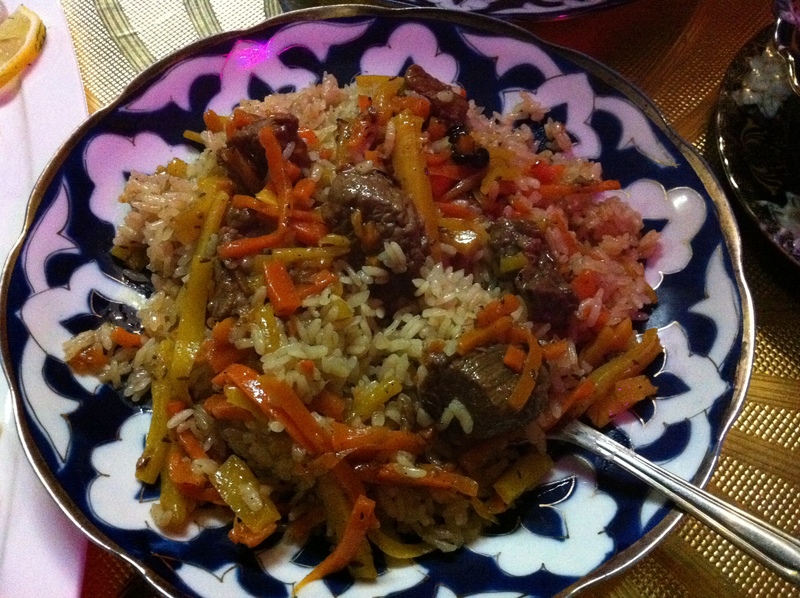 My most fervent hope, though, is that it’s not a few years before I have a decent Plov again. * My first review of Cheburechnaya is one of my most-viewed posts still, mostly due to it being linked to from the restaurant’s website. ** I infamously took a course in it, in fact, at The Esteemed Educational Institution.